Last Wednesday evening, the Olmsted Falls Board of Education met and approved a new five-year financial forecast for the school district. This action is required by Ohio law to be completed, and submitted to the Ohio Department of Education, by November 1st. To view the District’s new five-year forecast, please click here. 1. The Board of Education is expecting that financial aide, that comes from the school foundation program (state aide), will decrease by 5%. This amounts to a $524,192 reduction, annually, in real dollars. 2. Presently, the District is being instructed by the Ohio Department of Education to include all costs associated with full implementation of All-Day, Everyday Kindergarten. Therefore, $300,000 has been added to the annual budget, beginning in Fiscal Year 12 (2011-2012 school year) to cover this unfunded mandate. Even with a planned reduction in state aide ($524,192), and the implementation of the unfunded mandate ($300,000) of All-Day, Everyday Kindergarten, with prudent use of resources, the District still will be able to maintain the pledge it made to residents during the last levy campaign to manage for three years before requesting additional operating money. All parents who have provided current e-mail addresses to the District should have received an e-mail invitation last Thursday, October 21st, to participate in an on-line parent survey. This web-based survey will remain open through noon this coming Monday, November 1st. Parent participation in this 12-question survey will help provide a critical voice for our Board of Education as they continue to take a strategic, long-range look at the needs of the Olmsted Falls School District. We hope you will be able to take a few moments to share your thoughts. PLEASE NOTE: Due to a lack of pre-registered participants, the Flu Vaccination Clinic scheduled for this afternoon (Wed., October 27th, 4-7 p.m.) at Olmsted Falls Middle School has been cancelled. 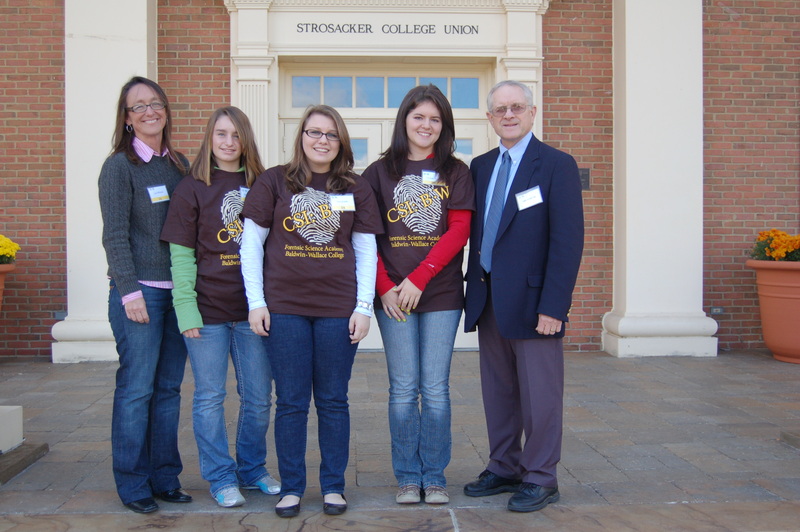 BW:CSI Academy participants (L to R) OFHS Chemistry Teacher Mrs. Lisa Whitney, OFHS juniors Hannah Whitney, Sam Kuehn and Chelsea Horvath, and BW:CSI Director (and retired OFHS science teacher) Mr. Jim Emigh. Three Olmsted Falls High School students, along with their science teacher Mrs. Lisa Whitney, were among 52 area high school students and science teachers attending the B-W: CSI Academy, a day-long mock crime scene investigation utilizing forensic science technology and collection techniques. This educational event took place on the campus of Baldwin-Wallace College last Friday, October 22nd. 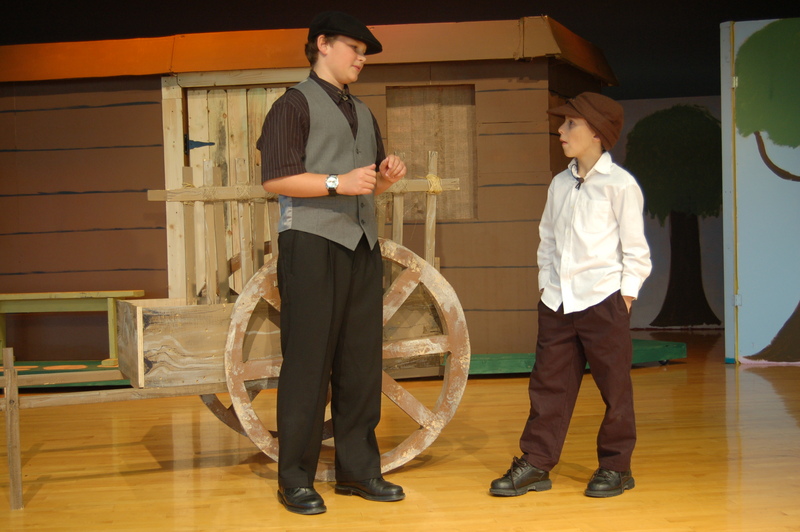 The high school teams were accompanied by B-W criminal justice and forensic science students, who worked as peer mentors, lab assistants, actors and crew. Law enforcement officers from the City of Hubbard Police Department led participating students from 25 schools through mock crime scenes staged on campus. Students collected evidence and then processed it in labs under the direction of B-W physics, chemistry and criminal justice professors. Funded primarily through Ohio Board of Regents’ STEM initiatives, B-W: CSI Day is among several educational programs offered by Baldwin-Wallace College to high school students. Its goal is to educate high school students about careers in science, including the teaching profession. The Olmsted Falls School District entered into a contract to provide bus maintenance services to Fairview Park City Schools. This new partnership began last spring, generating a new revenue stream for our District while providing a much-needed service for nearby Fairview Park. This is not the first time Olmsted Falls School District’s Transportation Department has entered into a regional agreement of this type. The District also provides maintenance and fuel services for Lakewood City Schools, as well as the City of Olmsted Falls. Click here to read an article from the Sun Post-Herald about this partnership with Fairview Park City Schools. 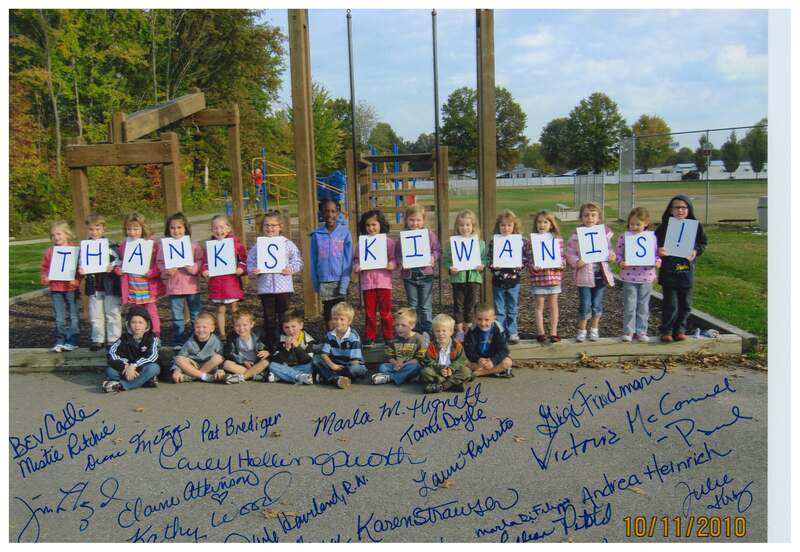 The District’s littlest Bulldogs, along with teachers and administrators at the Early Childhood Center, expressed big thanks by sending this special photograph to the Olmsted Falls Kiwanis Club to recognize their recent donation of $500 toward the purchase of new playground equipment at the ECC. Additional fundraising efforts are currently underway. Miss Baechle’s second graders are participating in a series of cooking activities this year thanks to the help of parent volunteers. A cooking activity can be a great change of pace and a good reinforcement of concepts being learned in the early primary years. 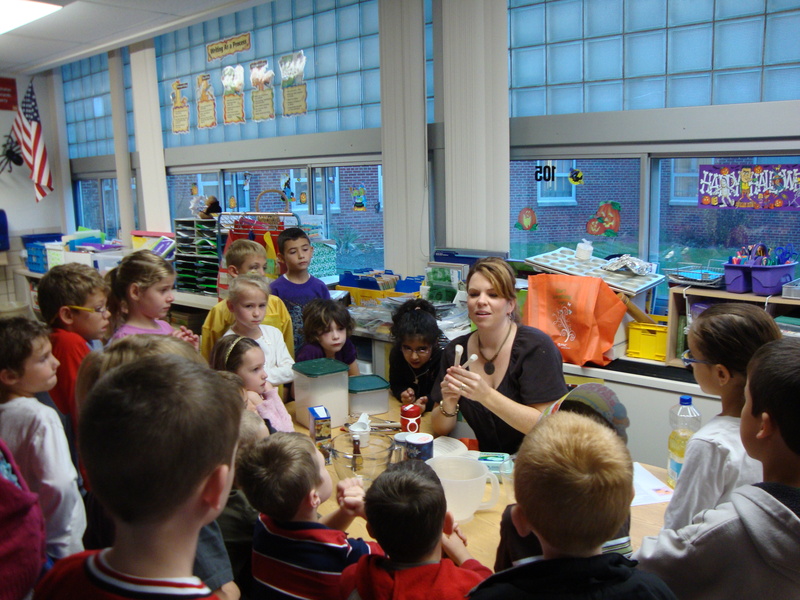 Many State standards are covered during the cooking activities such as: following two and three-step directions (language arts), choosing and using the best measurement tool for a job (math) using good safety procedures during an experiment (science), and using problem/solving/decision-making skills to solve problems independently or in a group (social studies). Students are also making individual cookbooks where they write about their experience, have a picture of them cooking and include the recipe. To date, cooking activities have included Mrs. Garcia’s French Bread Pizza, Mr. & Mrs. Skoutas’ French Toast, Mrs. Gonzalez’s Apple Turnovers, Mrs. Skoutas’ Pumpkin Pancakes, and Mrs. Gonzalez’s Monster Cupcakes. Students have been cooking over at OFIS as well! 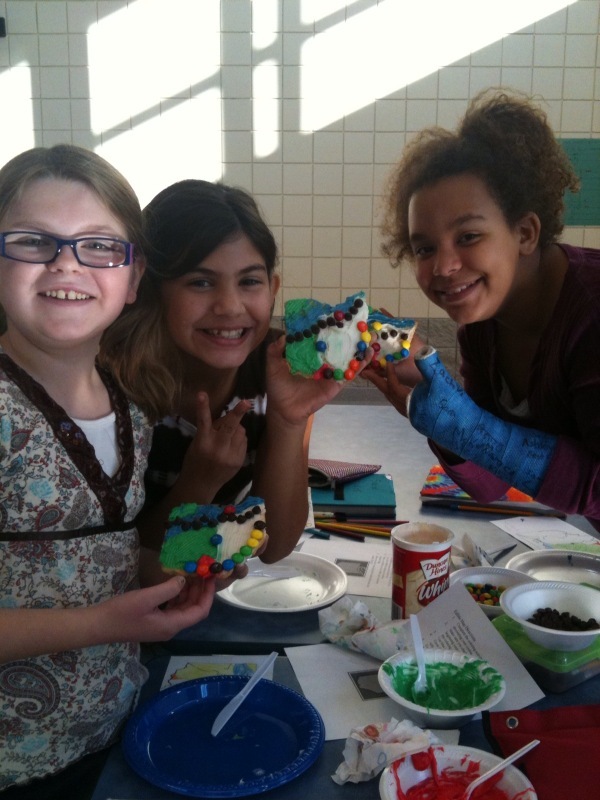 Fourth grade students in the homerooms of Mrs. Ambrosia, Mrs. Pojman, and Mrs. Tzolakis teamed up last Friday for a special “Cookie Day” to reinforce and celebrate recent Social Studies learning targets. The students, along with eighteen parent volunteers and their teachers, iced cookies to represent the regions of Ohio, the Ohio Divide and the Ohio River. A special thank you to all of the parents involved in both cooking projects! Your participation is very much appreciated! Students in grades K-3 will be taking part in the “Healthy Choices – Be a Healthy Hero” program. Students will receive a short education program on the importance of hand washing, healthy snacks and exercise. Parents will be able to participate in the program by encouraging these healthy choices at home, and students will have a chance to be the monthly “Healthy Hero” and receive a $5 “Toys R Us” gift card donated by the PTA. Preschool students will receive a simpler version of the program but will also have a chance to be the Healthy Hero. More information about the program will be sent home with the students in the next few weeks. This past Sunday, October 24th, three OFHS juniors were honored for achieving Eagle Scout status at the Eagle Court of Honor held at St. Mary of the Falls Parish Hall. Since only 2% of Boy Scouts obtain Eagle Scout status, this is a tremendous achievement. Congratulations to Matthew Wachowiak, Tom Hoy, and Kevin Bohland (pictured L to R) for this outstanding accomplishment. As health insurance costs have continued to increase, maximizing the health of staff members is one way that employers can ensure their organization is positioned to receive the best rates available. Olmsted Falls School District has had a Staff Wellness Program in place for the past several years featuring a number of components to promote healthy lifestyles among employees. One component of this Wellness Program is the annual Staff Wellness Fair – which provides all employees with an opportunity to participate in a number of free screenings as well as to receive their annual flu vaccine. 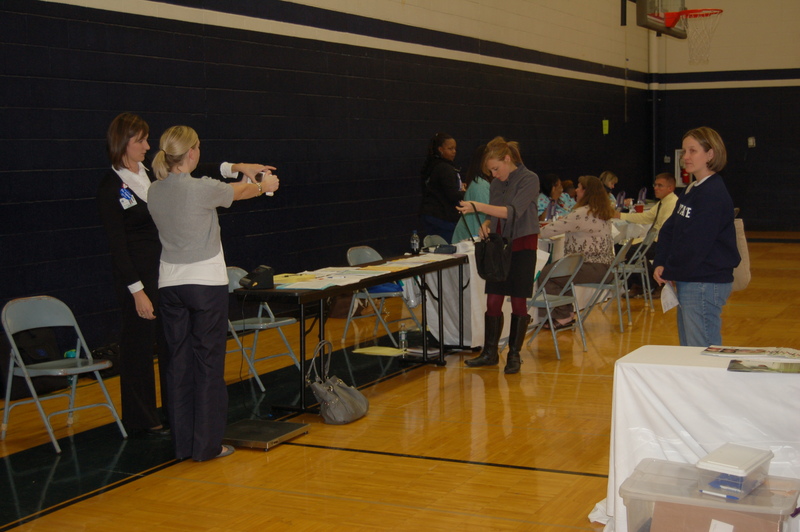 The 2010 Wellness Fair for staff took place in the High School Auxiliary Gym last Thursday, October 21st. OFHS SWIM AND DIVE TEAM PARENT MEETING – TONIGHT!! Also, all are invited to click here for information on the OFHS Swim & Dive Team’s Annual Candle Sale – ends Nov. 7th! Click here to read the latest on these and other events from the Olmsted Falls Athletic Boosters. Olmsted Falls Boys Developmental Basketball League – Begins THIS SATURDAY, October 30th – Click here for additional details and registration information. Olmsted Falls Junior Girls Basketball League – Begins THIS SATURDAY, October 30th – Click here for additional details. Halloween Trick-or-Treating in Olmsted Falls/Olmsted Township – THIS SUNDAY, October 31st, 6-8 pm BE SAFE & HAVE FUN! OECPTA’S “Night At The Aces” Fundraiser – Saturday, November 13th, 8-10 p.m. – Please click here for additional information. A reminder to parents that Olmsted Falls School District will be launching an on-line parent survey tomorrow, Thursday, October 21st. All parents who have provided current e-mail addresses to the District will receive an e-mail invitation to participate in this survey. The thoughts and opinions of our parents are important to us. Your participation in this 12-question survey will help provide a critical voice for our Board of Education as they continue to take a strategic, long-range look at the needs of the Olmsted Falls School District. The District will be using an on-line survey tool called Survey Monkey. Using our District’s existing subscription to this web-based survey service allows us to gather parent responses in a highly efficient and cost-effective manner. The questions being featured in this new parent survey have been replicated from professional surveys conducted for our District in year’s past. Not only does this benefit our District from a cost-efficiency standpoint, but it also allows us to compare current day responses to those gathered in the past. We look forward to sharing the results of this latest parent survey – as well as details of the Board of Education’s continuing strategic discussions — with our community. Please watch your e-mail boxes tomorrow for this link. We hope you will be able to take a few moments to share your thoughts. Dawn Moses, head volleyball coach at Olmsted Falls High School, recorded her 300th victory last week as the team defeated Berea last Tuesday. Moses is in her 15th year as head volleyball coach and to go along with her 300 victories, she has won or shared the Southwestern Conference six times, was a seven time district champion, has two state final four appearances, as well as her most notable accomplishment – the 2008 Division I State Championship. 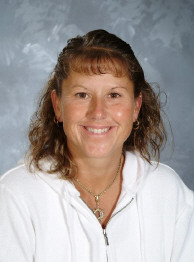 Over the course of her tenure at Olmsted Falls High School, she has had the pleasure of coaching fourteen All–Ohio girls and has been selected by her peers as the Southwestern Conference Coach of the Year three times, and Cuyahoga County Coach of the Year six times. Congratulations to Coach Moses! Also, good luck to Coach Moses and our varsity volleyball team as they begin sectional competition this Saturday at Midview High School at 1:00 pm. The girls ended the regular season last week, sharing the South West Conference Championship with Amherst. BULLDOG FOOTBALL NOMINATED AGAIN FOR CLEVELAND BROWNS HIGH SCHOOL GAME OF THE WEEK – VOTE TODAY! Each week, fans have the opportunity to select the Cleveland Browns High School Game of the Week throughout the regular season. Four panel members, including Dave Chudowsky (WKYC-TV 3), Matt Florjancic (www.ClevelandBrowns.com), Mark “Munch” Bishop (WKNR-850 AM) and Mike Snyder (WTAM-1100 AM) each nominate one game per week. Each Game of the Week will be covered by Browns reporters with highlights appearing on www.ClevelandBrowns.com, as well as other Browns programming. OLMSTED FALLS HIGH SCHOOL FALL CHOIR CONCERT TONIGHT! Olmsted Falls High School hosts its annual Fall Choir Concert this evening in the high school auditorium. All are invited to attend. Tickets can be purchased for $5 at the door. Senior citizens and children 5 and under are free. 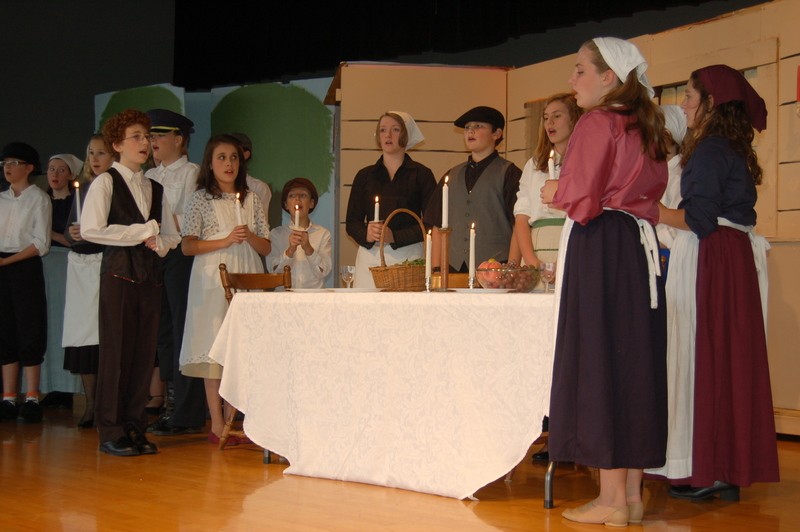 Drama Club students at Olmsted Falls Middle School put the finishing touches on their performances during final rehearsals held this Monday and Tuesday. TONIGHT!! Wednesday, October 20th at 4:30 p.m.
Thursday, October 21st at 7:00 p.m.
Friday, October 22nd at 7:00 p.m.
Senior citizens; children 5 and under are free. Olmsted Falls Intermediate School PTA is hosting a “Football Social” for 4th and 5th grade students in conjunction with this Friday’s home football game vs. Amherst. Tickets are $5 and include admission to the game, popcorn & a drink. Students are to be dropped off at the High School tennis courts by 6:45 p.m. All students attending the social will sit together in the south end zone. There will be parent chaperones with the students in the south end zone. Tickets are being sold during all lunch periods this week. Congratulations to the students and staff of Olmsted Falls Schools on these outstanding accomplishments! The Buckeye Association of School Administrators (BASA) awarded Olmsted Falls School District Superintendent Dr. Todd Hoadley with the Exemplary Leadership Award at the organization’s fall conference in Columbus this month. This prestigious award recognizes outstanding leadership which has resulted in the enhancement and improvement of educational opportunities for elementary and secondary students of Ohio. Olmsted Falls Intermediate School has been awarded a 2010 SOAR Award for High Progress by Battelle for Kids, a national non-profit organization focused on maximizing effective practices in schools. This annual award is designed to acknowledge Ohio schools participating in SOAR for their high academic progress in multiple grade levels and subjects over the most recent school year (2009-2010). As an award recipients, Olmsted Falls Intermediate School is among approximately the top 2 percent of schools (out of 542 participating SOAR schools) making exceptional growth with students. Well done! SOAR is a statewide pilot project led by Battelle for Kids that provides value-added analysis and professional development to Ohio school districts. SOAR’s purpose was to introduce value-added analysis to participating districts and demonstrate how progress information can be used as a diagnostic school-improvement tool. The Falls-Lenox/ECC PTA will hold its monthly meeting next Tuesday, October 26th at 7:00 p.m. in the Falls-Lenox cafeteria. 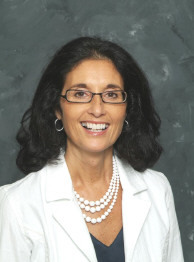 School Counselor Mrs. Angela Butto will be the featured guest speaker. Mrs. Butto will discuss with parents the role of the school counselor at the primary level and answer questions. Be sure to mark your calendars and plan to attend! Don’t forget – two $25 gift cards will be raffled off for those in attendance! Olmsted Falls School District is currently seeking to add to its roster of substitute school bus drivers. This is a great opportunity for parents or local community members. Applicants are encouraged to apply on-line, and then notify the Bus Garage via phone at 427-6350. Note: Once on-line, please select the “Start an application for employment” option, and follow the instructions on the screen. Attention students and parents! The Crystal Apple Awards has been a part of The Plain Dealer since 1991 as part of The Plain Dealer’s 150th Anniversary celebration. 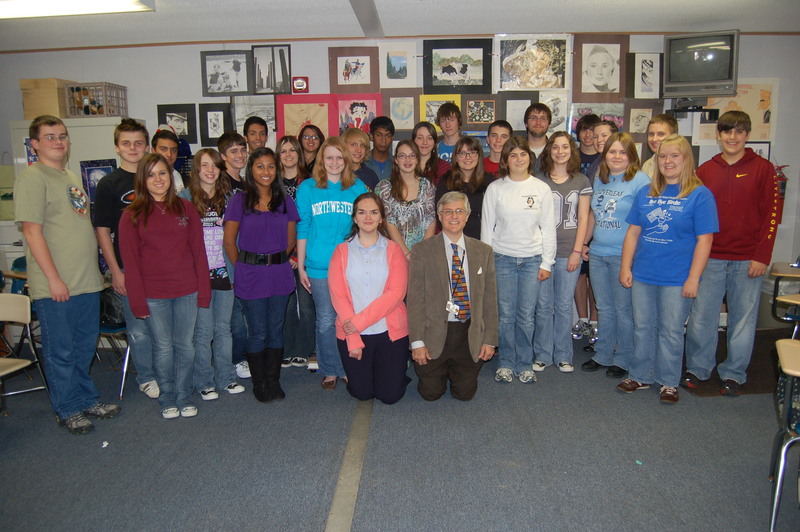 The 2010-2011 school year marks the 20th anniversary of The Crystal Apple Award, which recognizes educators who have inspired, challenged, supported and helped someone realize their true potential. Four times a year, The Plain Dealer accepts nominations for the Crystal Apple Awards to give individuals an opportunity to thank that extraordinary educator by nominating him or her. To be nominated, an educator must currently teach full-time in any grade K-12 in a school within The Plain Dealer seven-county distribution area (Cuyahoga, Lake, Geauga, Portage, Summit, Medina and Lorain Counties). There are four recognition periods each school year. Each recognition period, an independent panel of judges will select three outstanding educators from the nominations received during that period – one from each of the following grade categories: K-5, 6-8 and 9-12, for a total of 12 Crystal Apple Award winners this school year. Each winning educator will be recognized individually at a surprise presentation at their school where representatives from The Plain Dealer and Bryant & Stratton College will personally congratulate the winning educator. In addition to recognition received in The Plain Dealer, all 12 winning 2010-2011 Crystal Apple Award winning educators will each receive their Crystal Apple at an awards banquet held at The Plain Dealer in May 2011. Olmsted Falls Youth Coaches Clinic – October 23rd – Olmsted Falls Head Basketball Coach Chris DeLisio is offering a “Youth Coaches Clinic” targeted to area basketball coaches. Please click here to download flyer with further information. Flu Vaccination Clinic at Olmsted Falls Middle School – Wednesday, October 27th, 4 pm – 7 pm – Sponsored by PTA. Click here for additional details. Important Note: Effective this year, you must pre-register; no walk-ins will be accepted on the day of the clinic. Olmsted Falls Boys Developmental Basketball League – Begins Saturday, October 30th – Click here for additional details and registration information. Olmsted Falls Junior Girls Basketball League – Begins Saturday, October 30th – Click here for additional details. Halloween Trick-or-Treating in Olmsted Falls/Olmsted Township – Sunday, October 31st, 6-8 pm – BE SAFE & HAVE FUN! Congratulations to the OFHS Forensics Team, led by advisor Mr. John Mercer, for earning the National Forensics League’s (NFL) Leading Chapter Award in the North Coast District. This coveted award, based on student participation, is the highest honor the NFL can bestow upon a chapter. Only one school in each district attains this designation each year. This year, out of more than 2,800 NFL member schools nationwide, Olmsted Falls High School is one of only 105 to receive the Leading Chapter Award. Well done! 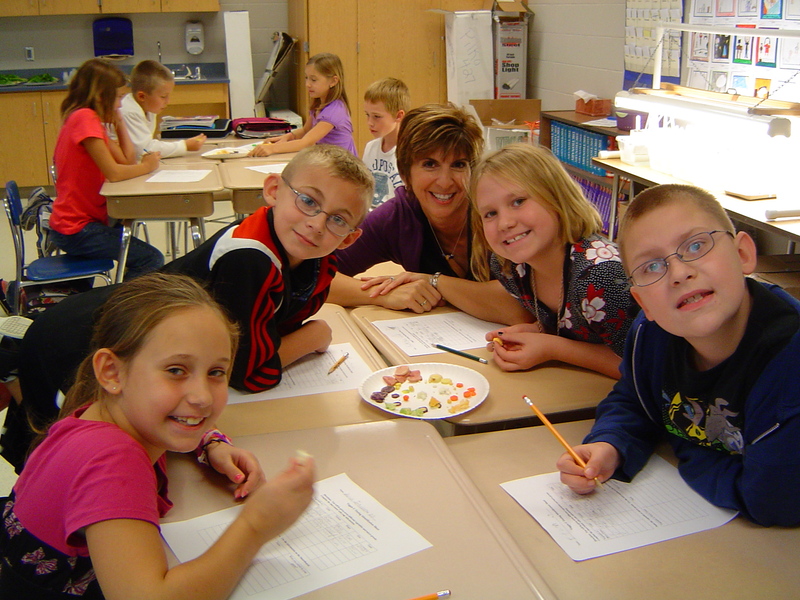 Fourth grade teacher Mrs. Gina Pilko works with students as they taste test a variety of specialized vegetables provided by the Culinary Institute. Thanks to the generous support of the Olmsted Falls Garden Club, fourth graders at Olmsted Falls Intermediate School are participating in a unique program called “Veggie U” for the second consecutive year. “Veggie U” is taught as part of the 4th grade science unit on plants. Created by the Culinary Vegetable Institute in Huron, OH, the “Veggie U” program focuses on sustainable agriculture and how food is grown (i.e. importance of soil, composting, worm farms). Hands-on elements, such as taste testing and growing their own lettuce under special “grow lights,” are popular with students. The students recently got to taste test a variety of unique vegetables – including purple carrots and orange cauliflower – grown by the Chef’s Garden at the Culinary Institute for chefs all around the country. Proceeds from the Olmsted Falls Garden Club’s annual plant sale were used to purchase all of the educational materials, related supplies and equipment for the implementation of the “Veggie U” program at Olmsted Falls Intermediate School. 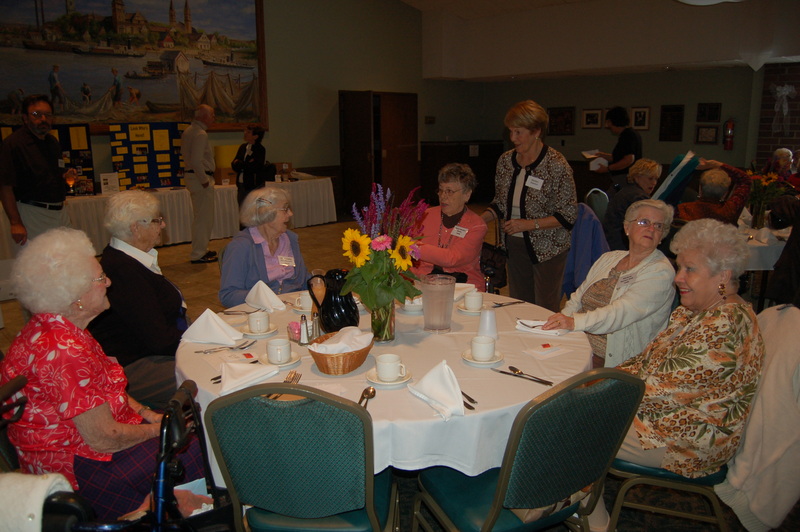 Many thanks to the Olmsted Falls Garden Club for its support of this innovative learning opportunity! The thoughts and opinions of our parents are important to us. As you know from previous blog news, the Olmsted Falls Board of Education is currently taking a long-range look at the needs of the Olmsted Falls School District. In an effort to gather parents’ thoughts, the District will be asking parents to participate in an on-line survey. All parents in the District who have provided their e-mail addresses will be sent a link to participate in the e-survey at the end of next week. Please watch your e-mail boxes for this link. We hope you will be able to take a few moments to share your thoughts. 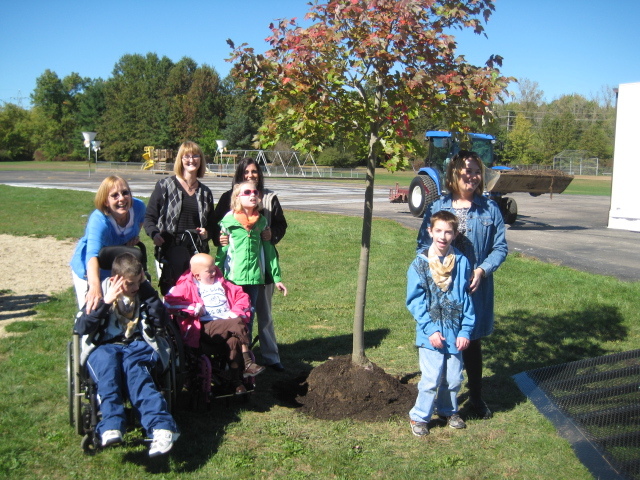 A special tree was planted last week in remembrance of young Ariel Jenkins, a Falls-Lenox student in Mrs. Schoenhofer’s classroom who passed away last spring. “Ariel’s Tree” is now in place at the edge of the grass near the Falls-Lenox playground (see photo at right). 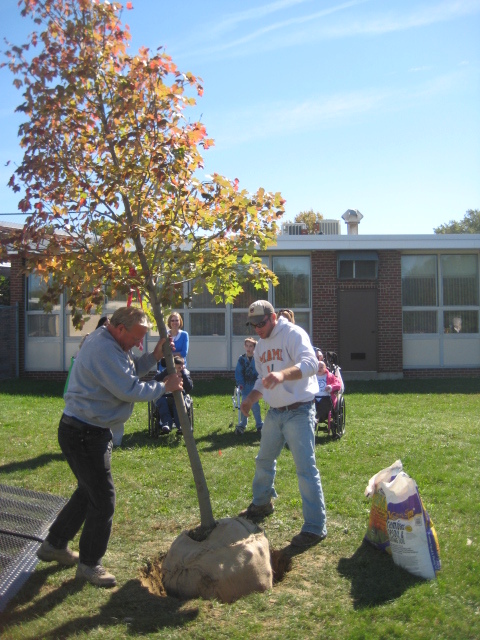 Thank you to all who worked to bring this special tree to Falls-Lenox, including all of our District PTA Units that joined together to contribute the funds to purchase the tree. An important reminder for all parents that there is NO SCHOOL this Friday, October 15th. The Olmsted Falls School District, along with surrounding districts and districts throughout the State, will be closed for the annual NEOEA Day. The 2010 Powder Puff Football Game features Senior Girls vs. Junior Girls this Saturday, October 16, 2010 at the High School Stadium. Tickets are $5 ($4 pre-sale at school for students only). Gates open at 5:00 p.m. The game starts at 6:00 p.m. Don’t miss all the fun and festivities including half-time games, raffles and concessions. All proceeds benefit OFHS Post Prom Committee. Thank you Ben! Go Bulldogs! The Olmsted Falls High School football team has expanded storage space for their practice gear thanks to Bulldog senior, and member of the varsity football team, Ben Coyle. In addition to refurbishing the existing shed (pictured on the left), Coyle built a brand new shed (pictured on the right) which was quickly put to good use. 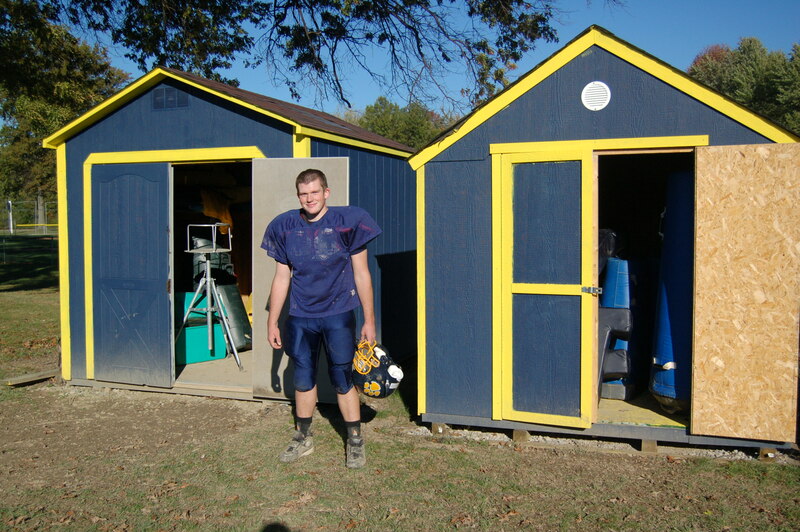 Coyle built the shed as his Eagle Scout Project and was able to complete the job thanks to the generous donations of local community businesses and the Olmsted Falls Athletic Boosters. 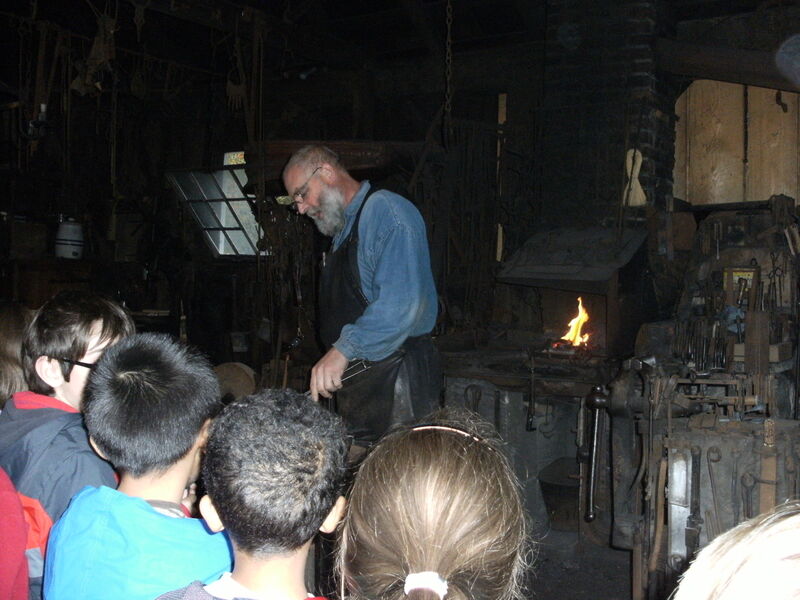 Second graders from Falls-Lenox took a field trip to Hale Farm & Village last week. 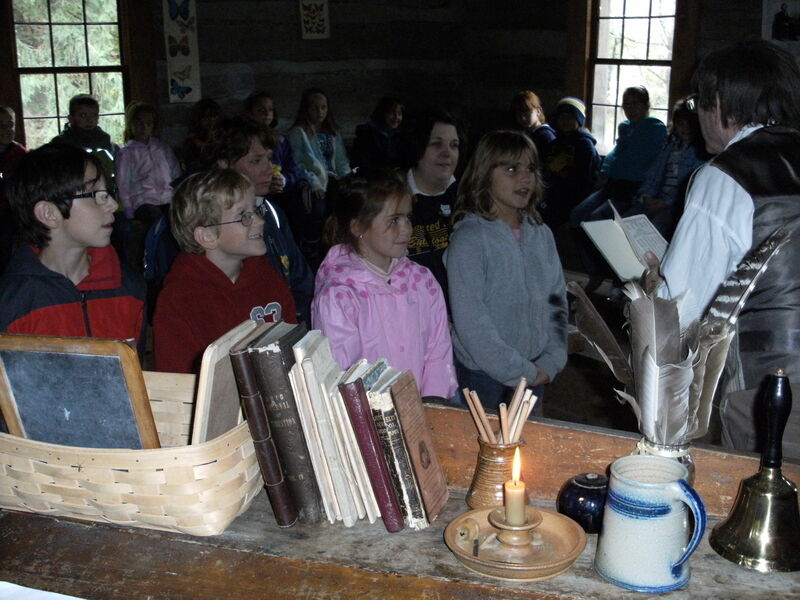 Students got to tour the historic farm and learn about life in the 1800’s as they toured the surrounding village. Special encounters including the blacksmith shop, the glass blower and the old school house – all featuring docents in period dress. As the end of the first nine weeks of school approaches, Parent-Teacher Conference nights are hosted at each building. The first of two fall conference nights at Olmsted Falls High School took place last week providing parents an opportunity to connect face-to-face with teachers. The second parent conference night for OFHS is scheduled for November 22nd. It has been the Olmsted Falls School District’s quest to offer an ADK program for parents who desire this option for the past four years. Four years ago, the District did not have space to offer any type of ADK program. However, knowing that a bond issue had been passed and additional classroom space at the ECC would become available, the District started moving forward with its plans to offer ADK. At that time, the model that the District was working toward was implementing an ADK program, that would contain an additional fee for parents who desired to have their children receive these extra educational services. Note: this is a model that is utilized by several neighboring school districts. However, about two years ago, Governor Strickland and the state legislature changed several laws regarding the operation of schools. 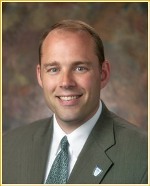 (Often referred to as House Bill 1 or HB1). These laws mandated that districts offer a free ADK program, and made charging for an ADK program illegal. This law (HB1) also allows districts to apply for a waiver to delay implementation of this ADK requirement. For the 2010-2011 school year, Olmsted Falls City Schools applied for, and received this waiver. Without the ability to cover the costs through the implementation of a fee for families of students interested in an ADK program, the Olmsted Falls School District did not have the funds available to operate one. Please note that while HB1 mandates the implementation of ADK, no additional funding from the state was provided to help local school districts with implementation. In fact, with the economic crisis facing our state, our amount of state aid actually was reduced. As such, ADK is an unfunded mandate and it is expected that local school districts find the necessary funds, either by utilizing the funds in their existing budget or by asking taxpayers to approve additional millage. The Ohio Department of Education (ODE) has been stating to school districts that it will not approve waivers for the 2011-2012 school year. However, nothing in House Bill 1 precludes ODE from granting waivers for the 2011-2012 school year. The Olmsted Falls School District has calculated that, at a minimum, implementing ADK would increase District expenses by $300,000. Additionally, this expense would grow on an annual basis by around 3%. With school funding so uncertain and further budget cuts being predicted at the state level in the next biennium budget (which begins 7/1/11), I am personally fearful that implementing ADK will not allow the District to maintain its pledge to make the recently passed operating levy last three school years. There are other options. Rather than adding six additional teachers, the District could simply move currently employed teachers out of their present teaching assignment to teach kindergarten. This would reduce the number of sections offered at grades 1 – 8, which would further increase class sizes at those levels. Another option would be to reduce / eliminate educational elective courses currently being offered at the MS and HS and redirect the money from those programs to hire teachers for ADK. It is my belief that neither of those two options are beneficial for our total educational program. There is a political component to this as well. Many sections of HB 1 may change depending on who is elected Governor in November. HB1 is the educational vision of Governor Strickland and ADK is one of his main platforms. If he is not re-elected, the ADK requirement will likely be stricken from this law. Finally, please note that all of what I have written above is based upon the present and perceived future condition of our District finances. I consider myself a strong proponent of early childhood education and ultimately would love to see our District offer ADK. However, I also consider myself a realist, and if the implementation of ADK requires a degradation of other parts of our educational program, then I feel it is best to wait until other funding options become available. The Olmsted Falls PTA Council is selling Shopping Passes for $5.00 for the Macy’s Shop For A Cause Event to help raise scholarship funds for graduating seniors. Since 2006, Macy’s Shop For A Cause Event has partnered with non-profit organizations nationwide to raise more than $34 million for their ongoing charitable efforts. This is your chance to be part of this monumental event on Saturday, October 16, 2010. Customers purchasing tickets benefit by receiving incredible store-wide shopping savings all day on October 16, 2010. Macy’s will also host special events, prizes and other in-store excitement. Plus, you can enter to win a $500 Macy’s Gift Card. Click here for flyer with additional details. For more information or to purchase a pass, please contact Kim Cleary (cleary101@sbcglobal.net). Homecoming weekend and the days leading up to it were packed with events for Bulldogs past, present and future. 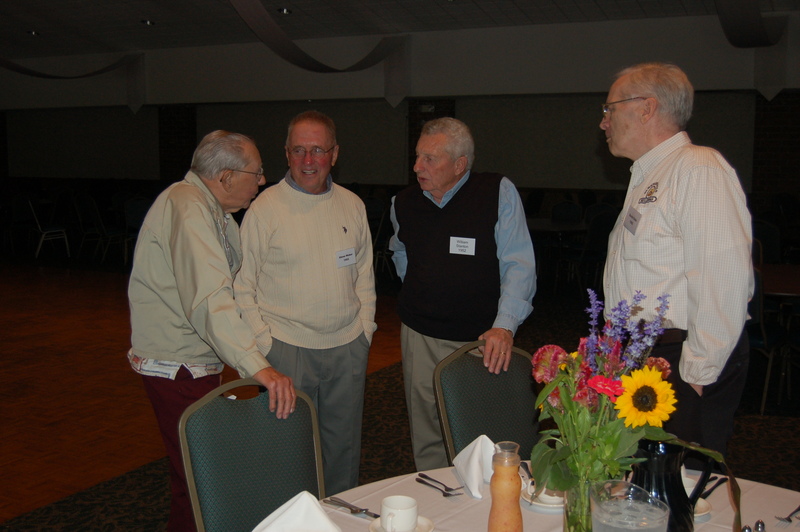 More than 100 guests attended the Annual Golden Grads Reunion Lunch on Wednesday, September 29th for Bulldog alumni from the Classes of 1934 to 1968. Many traveled from out-of-town to attend and stayed through the weekend for a variety of reunion and Homecoming festivities. On Friday, October 1st, the Bulldog football team brought fans a Homecoming victory with a 24-14 win over Brecksville-Broadview Heights. Go Bulldogs! 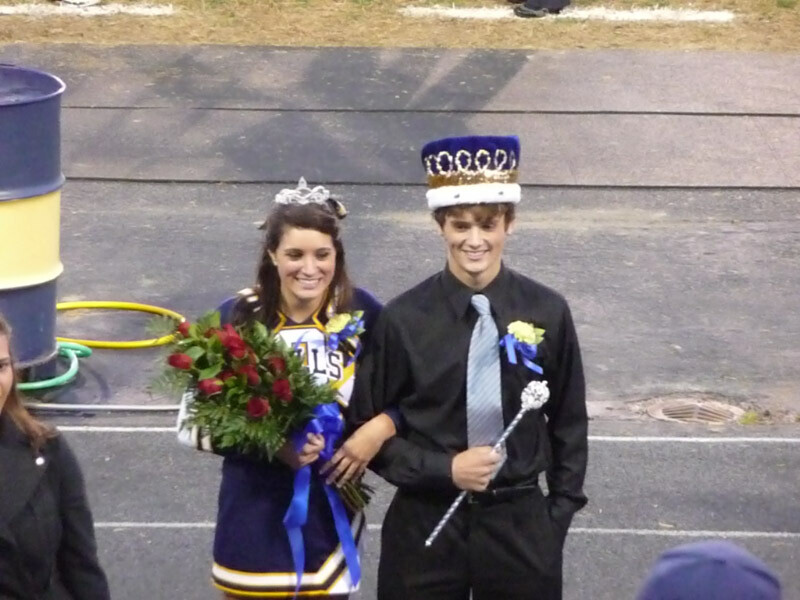 OFHS Homecoming Queen & King, Jen Beck and Eddie Looby, at Friday night's football game. A capacity crowd of current OFHS students attended the annual Homecoming Dance held Saturday night at the High School. Congratulations to this year’s Homecoming Queen Jen Beck and Homecoming King Eddie Looby. A special thank you to the Olmsted Falls Kiwanis Club for hosting a free pancake breakfast for the community on Sunday, October 3rd. This community event has fast become a Homecoming weekend tradition in the community. Donations collected at this event benefit the Kiwanis Scholarship Fund for upcoming graduates from the OFHS Class of 2011. News of the High School’s innovative new Shadowing Program was shared with parents District-wide via e-mail last Friday. The OFHS Guidance Department is currently seeking parent volunteers willing to share their careers with our high school students. This invitation to participate in the new OFHS Shadowing Program is being extended to all parents District-wide, as well as local community businesses. We know that there are many valuable resources for our students right here in our own community! An important reminder for all parents that there is NO SCHOOL next Friday, October 15th. The Olmsted Falls School District, along with surrounding districts and districts throughout the State, will be closed for the annual NEOEA Day. 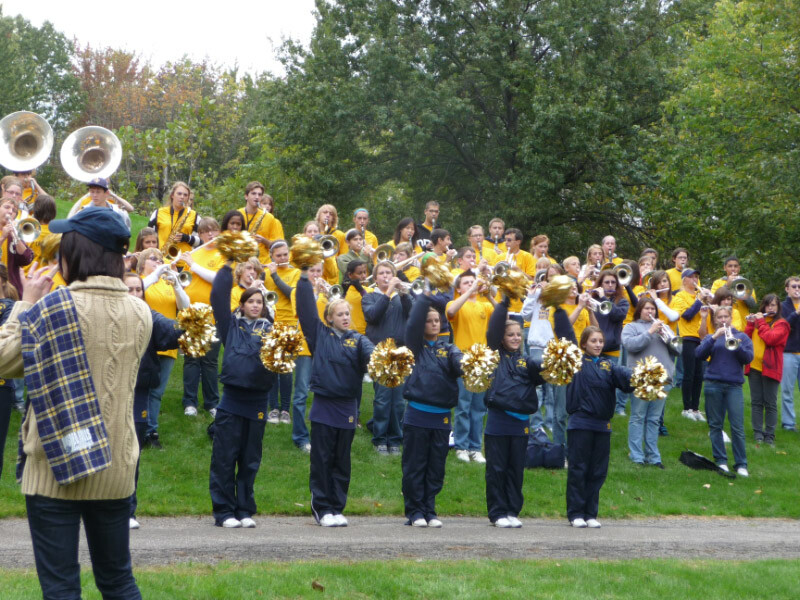 Olmsted Falls community members attending the Annual Falls Day in the Park event last weekend were treated to a special performance by the Olmsted Falls High School Marching Band! 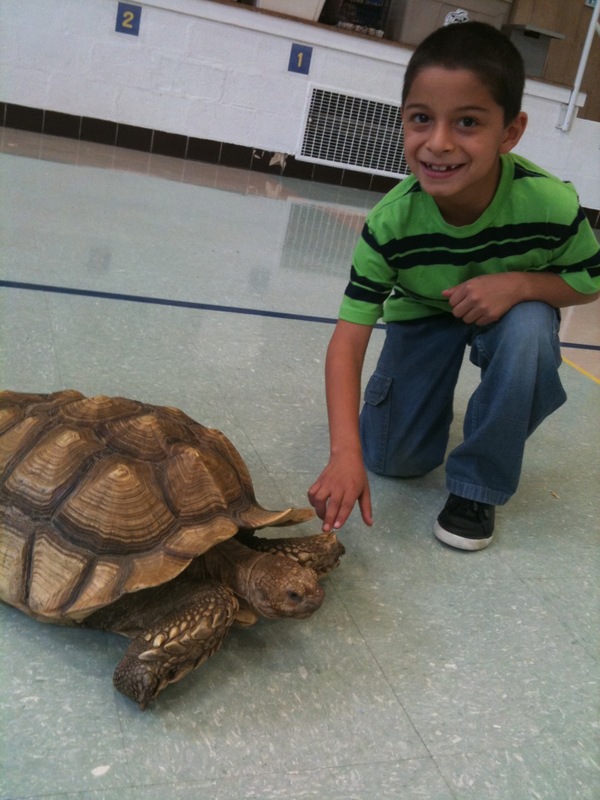 Students at both Falls-Lenox Primary School and the Olmsted Falls Early Childhood Center were treated to a special visit by the one and only Jungle Terry last week. 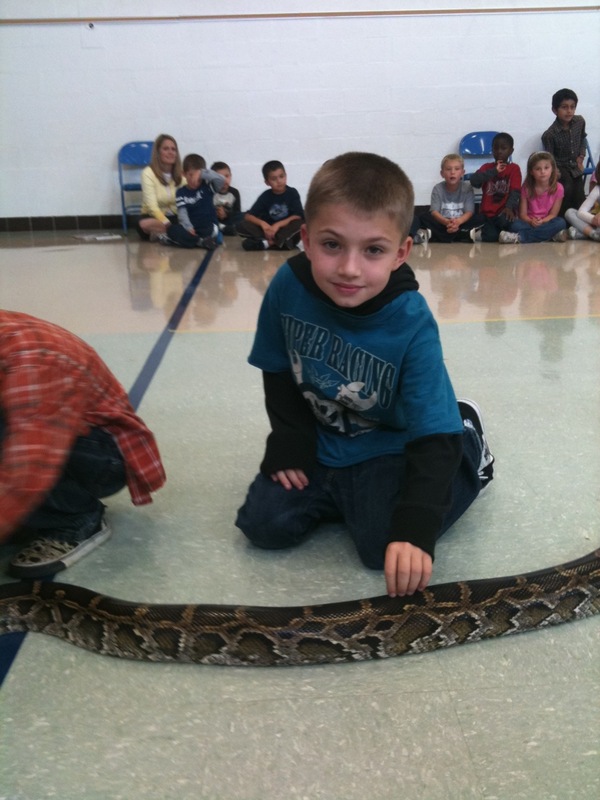 Students at both buildings were thrilled as Jungle Terry introduced them to more than a few of his exotic animal friends. Parent and teacher support of our local PTA units makes these fun and educational opportunities possible for our students. Starting this season, fans will have the opportunity to select the Cleveland Browns High School Game of the Week throughout the regular season. Four panel members, including Dave Chudowsky (WKYC-TV 3), Matt Florjancic (www.ClevelandBrowns.com), Mark “Munch” Bishop (WKNR-850 AM) and Mike Snyder (WTAM-1100 AM) will each nominate one game per week. Students, parents, and staff are encouraged to go on-line TODAY and cast their vote! Each Game of the Week will be covered by Browns reporters with highlights appearing on www.ClevelandBrowns.com, as well as other Browns programming. The book collection at Falls-Lenox School Library just got larger thanks to a donation of books by the Olmsted Falls Kiwanis Club. 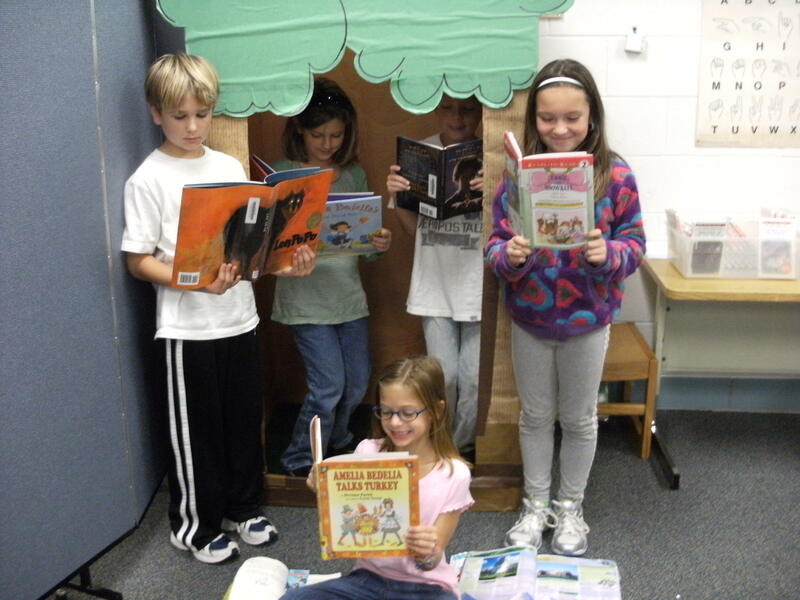 Students at Falls-Lenox are enjoying the new selection of books. Thank you to the Olmsted Falls Kiwanis Club for its ongoing support of our schools! On Saturday, October 2nd, Olmsted Falls High School hosted the North East Region Fall Kickoff Tournament. With local parents, Kiwanians, Key Club members, and teachers serving as volunteers for the event, the tournament ran smoothly. It culminated with a dramatic win for the Olmsted Falls Academic Team (A) over Copley High School (A) 430-185. The Olmsted Falls Academic Team (B) finished third in their bracket, while the C-Team finished in a tie for second in their bracket. The Bulldog D-Team won the JV Division. The #2 individual scorer in the tournament was Jim Coury. The #5 individual scorer in the tournament was Sohan Vartak. The OFHS Academic Team wishes to thank once again all of the volunteers who helped make this tournament possible! The Olmsted Falls Cheerleading Squad was one of several local high school cheerleading squads that participated in the Cox Communications Cheer Contest. The Bulldog Cheerleaders’ original chant stood out above the rest and earned them a $250 check award. Olmsted Falls Schools Director of Food Services Denise Tabar, M.S.R.D.L.D., leads BMI tracking effort, sharing our District's process with other districts across the State to help them get started. Olmsted Falls City School District has been collecting Body Mass Index (BMI) data for students in grades 1-5 since the 2004-2005 school year, and for students in grades 6-8 since the 2007-2008 school year. The first year this data was collected established a baseline for the numbers of overweight and obese students in Olmsted Falls City Schools. This baseline data provided a valuable tool for the District to use as one objective way to measure progress in future years. BMI tests are now mandated for all schools, however, school districts have the ability to opt out this year and begin this process next year. Olmsted Falls School District has chosen not to opt out since we are already collecting this data. It has been important to look at District trends in BMI data to help the school wellness team better understand the impact of wellness protocols and activities already in place, support program planning and improve its approach to student wellness. In addition, this BMI information can help improve the overall awareness in the school community of the importance of healthy eating and daily activity. In the 2004-2005 school year, the Olmsted Falls City School District reported 18.4% overweight students and 15% obese students. In the 2009-2010 school year, the Olmsted Falls City School District reported 15.68% overweight students and 12.75% obese students. This is a decrease of 2.72% in the overweight category and 2.25% in the obese category over a 5 year period. To date this information has only been reported as aggregate data by grade, gender and by district. The BMI data collection is a voluntary process with great attention given to student’s privacy. Approximately 3% of the parents decline to have their student(s) measurements taken. Completed for aggregate use only, the collection of BMI data has been one very useful tool to help the district assess the childhood obesity issues in our community. If your child has a chronic illness or condition (like asthma, food allergies, etc) that may need to be treated during the school day, we strongly recommend you submit a health care plan to the clinic. The health care plan outlines what you and your physician would like the staff to do if your child becomes symptomatic during school. You can obtain a health care plan form from your school’s clinic staff. If your child does experience symptoms at school and there is no care plan available, staff will notify you, and if necessary, call 911. In the last several years, Ohio has seen outbreaks of Chickenpox (Varicella) and Whooping Cough (Pertussis). Children who aren’t properly vaccinated or who don’t have evidence of vaccinations or history of the disease must be excluded from school if there is an outbreak. If you haven’t already done so, please submit an updated immunization record to your child’s health clinic ASAP. All seventh graders were required to receive a Dpt (Diptheria, Pertussis, Tetanus) booster prior to the start of school. Click here to read the latest on events and news from the Olmsted Falls Athletic Boosters. 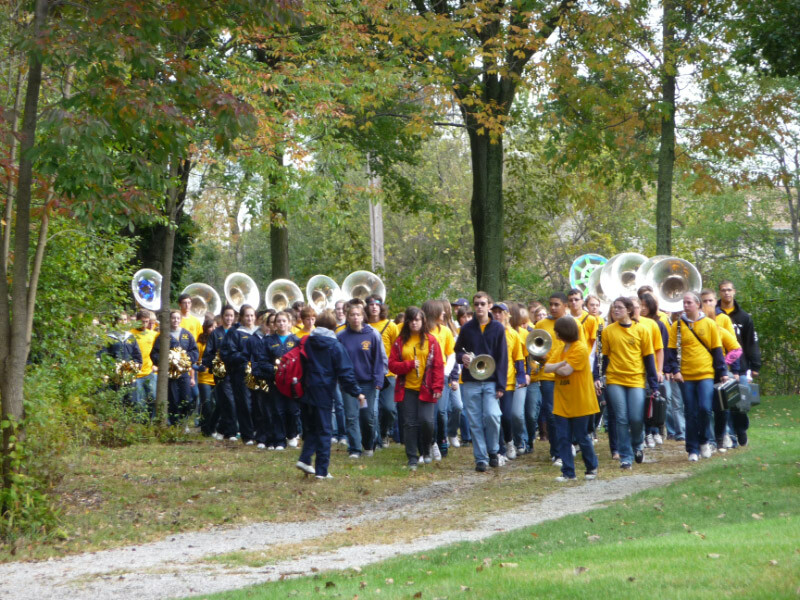 Click here to read the latest on events and news from the Olmsted Falls Music Boosters. Olmsted Falls Boys Developmental Basketball League – Begins Saturday, October 30th and runs through Saturday, December 4th – Click here for additional details and registration information.